On the top floor of Culzean Castle (pronounced Cull-ANE), in Scotland’s southwest corner, just 50 miles from Glasgow, is a special place. It was where Dwight D. Eisenhower went to get away and relax. To feel pampered and free from the stresses of being a hero… and later a President. Now you can go there too. You can even sleep in Ike’s bed. The main facade of Culzean Castle, on the Ayrshire coast of SW Scotland, glows in the warm light of the Golden Hour. In the large courtyard of Culzean Castle, a long queue of people wait to pay the fee to tour the public rooms. It’s no wonder. The 18th-century Robert Adam masterpiece is glorious. The castle, which belongs to the National Trust for Scotland, is a popular spot with tourists. They wait patiently—or not—to gaze at the armor, the massive curved staircase, to wander through the high-ceilinged rooms and admire the elegant furnishings, the elaborate plastered ceilings, the gilt and marble. From the looks of the line, it‘s going to be awhile before the last of them gets in. But that’s just what staying at the Eisenhower Hotel at Culzean Castle does to you. It makes you feel special, pampered, like an important and special guest of the house. It was afternoon when our group arrived at Culzean, and misty. To get the full effect of the castle’s magnificent first impression, we opted to ignore the elevator and enter though the main hall. Robert Adam’s grand sweep of oval, colonnaded staircase at Culzean takes you up to the Eisenhower Gallery on the top floor. It was a good choice. Our first view of Culzean’s interiors was the great sweep of Adam’s double-curved and colonnaded oval staircase. We stepped from marble to carpet the rich red of the best British claret. We tried to keep our jaws from dropping as we rose to our home for the night. Home? The idea made me smile. When we’d climbed to the Eisenhower Gallery on the top floor, a very un-stuffy butler greeted us and ushered us into the round sitting room. A misty sky veiled the wide view of the Firth of Clyde from the windows. We were grateful for the welcoming fires crackling in the pair of fireplaces at opposite ends of the large room. We had arrived just in time for tea. Steaming pots of tea, dainty sandwiches, light scones, jam, and double cream served by a butler—could anyone ask for a more perfect welcome to a Scottish castle? It felt like we were at a genteel British country home house party from the 19th century. The round sitting room at the Eisenhower Hotel at Scotland’s Culzean Castle is a lovely meeting place for Afternoon Tea. But why is a Scottish hotel in a castle in Ayrshire named after an American general and president? In the region where Robert Burns, the national poet of Scotland, lived and wrote, how did Dwight Eisenhower come to have his Scottish White House? Before World War II, Culzean was the home of the wealthy and prestigious Kennedy family for many generations. As direct descendants of Robert the Bruce, the Kennedy’s were one of the most important families in Scotland. 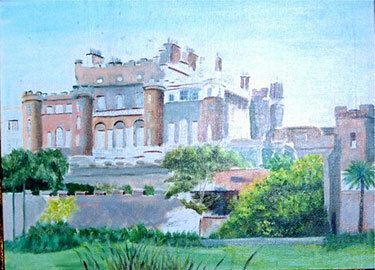 It was David Kennedy, 10th Earl Cassillis, who commissioned Robert Adam to redesign the original 16th-century castle. Adams, the most important architect of his day, finished the Georgian masterpiece in the 1790s. By 1945, the owner had been made the Marquess of Ailsa. The country was beginning its long recovery from the ravages of World War II. Taxes were high and the Marquess decided it was the better part of financial valor to gift Culzean to the country. He made his generous gift to the National Trust for Scotland. 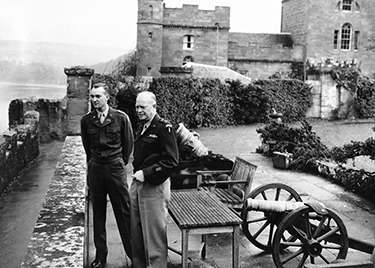 General Dwight D. Eisenhower on his first visit to Culzean Castle, in Scotland, with his son John, in 1946. But the gift contained one stipulation. On the top floor, they must create a self-contained apartment reserved for the use of General Dwight D. Eisenhower during his lifetime. The gift was made as gracious thanks from the people of Scotland to the Supreme Commander of Allied Forces in Europe, for his part in saving Europe from the Nazi nightmare. Eisenhower visited Culzean Castle several times, including once as President. He loved Culzean. “I can relax here,” he said of it. It was easy to see why he loved it. So did I.
Warmed and satisfied after tea and those lovely scones and jam, I was happy to have the friendly housekeeper show me to my room. Others in our group of travel writers were led to the Eisenhower Suite (yes, Ike Slept Here), the Cairncross Suite, or one of three other rooms. I was taken to the Ailsa Suite. After asking if I preferred tea or coffee to be brought in the morning, she left me to enjoy my room. And what a delightful space it turned out to be. was my most comfortable home for the night. 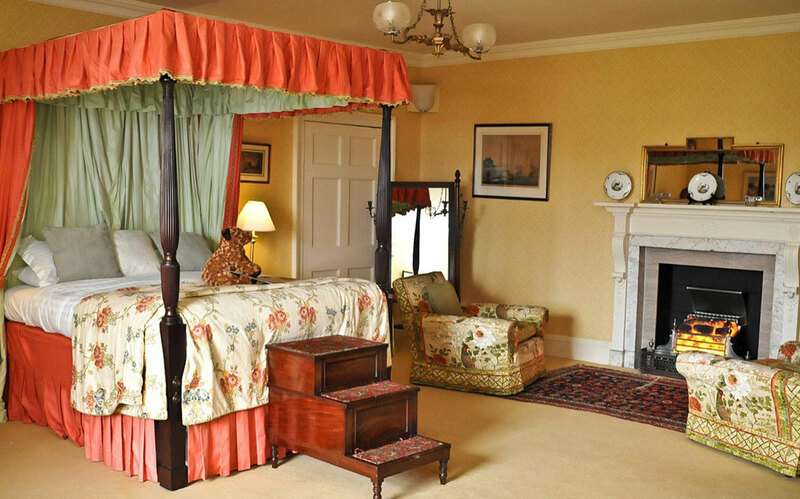 The carved and canopied four-poster bed is original to the Kennedy family. I loved having to climb the trio of wooden stairs to get up into it because of its height. A fire was already burning brightly in the marble fireplace. The bathroom was huge and I made a mental note to enjoy the deep tub later. The mist was clearing and pale sunshine began to seep through the sky, lighting the impressive views of Culzean Bay as well as the Clock Tower Courtyard below. As inviting as the stuffed chairs before the fire were, I wanted to take advantage of that bit of sun. Coat, scarf and gloves on, I headed out to explore. Culzean Castle is magnificent from the water of Scotland’s Firth of Clyde. The top floor of the central drum tower is the round sitting room, where we had tea. 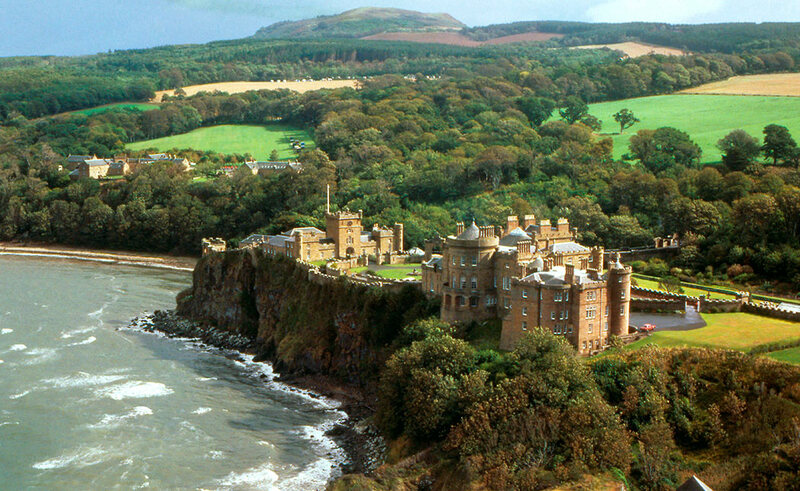 Culzean Castle reigns from atop a 100-foot cliff overlooking the Firth of Clyde where it flows into the Irish Sea. It commands sweeping views of the water and the haystack peak of Ailsa Craig, a rock island jutting up 10 miles offshore. They say that on a clear day you can see the coast of Northern Ireland. It wasn’t clear that day, but the mist had lifted enough to reward a shoreline wander. I took the path down the cliff to the rocks below. I wandered and jumped over tide pools, picked up stones and shells and watched a crab scuttle away. I listened to the waves as they rippled over the rocky beach like music. I felt the salt on my skin and my tongue. I admired the view back up at the huge, elegant pile of stone. From the water, you get a powerful overview of Robert Adams’ brilliance with the architecture—elegant, imposing, opulent… but seeming just a bit lonely, perched there on its cliff facing the sea. Finally the chill drove me back up the cliff, across the extensive gardens toward the castle. It was then that I made use of my key to bypass that line of tourists waiting to tour the public rooms. There was just time to warm myself a bit in front of my private fire before a pre-dinner drink in the sitting room. The three-course meal in the dining room was as elegant and finely detailed as the hotel itself, yet not at all stuffy. My red pepper-crusted salmon with couscous was perfectly cooked, pink, moist and flaky. The vegetables came from the property’s own gardens as did the fruit in my fruit crumble dessert, served with Arran ice cream. After-dinner coffee and conversation in the round sitting room, with a pair of fires roaring, completed the day to perfection. Next morning’s breakfast was everything you’d hope for in a Scottish castle, with rashers of thick Ayrshire bacon, smoked salmon and perfect oatmeal among the options. 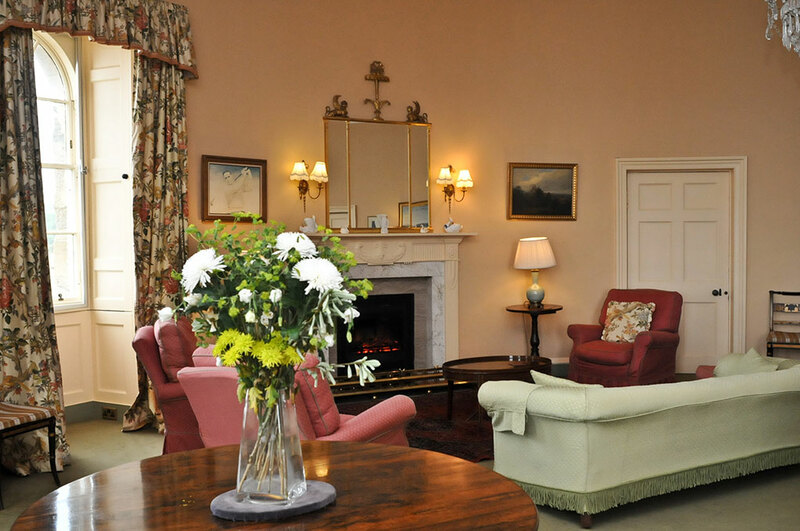 Before leaving Culzean Castle, you really have to tour the public rooms of this stately home. 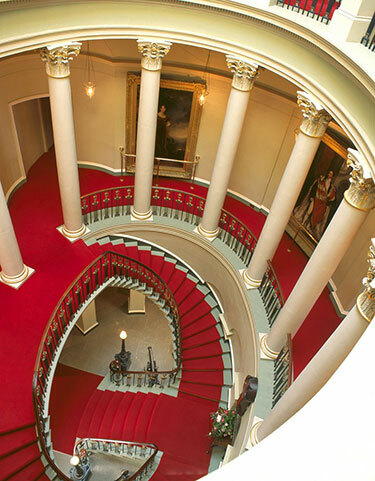 The neo-classical Georgian interiors open to the public include the State Bedroom and Dressing Room, the Dining Room, the Round Drawing Room with its beautifully plastered and painted Adam ceiling, the Blue Drawing Room, Lady Ailsa’s Boudoir and the Kitchens. All are worth your time. President Eisenhower painted when he visited at Culzean, including this lovely watercolor of the main facade of the castle. The property itself comprises more than 600 acres. Stables and a gas house and other out-buildings are surrounded by gardens, ornamental ponds, a deer park, follies. There is a conservatory, an herb garden, orchards, a peach house and an elegant camellia house dating from 1818. The formal terraced garden and Fountain Court are filled with flowers. Add in the 13-acre swan pond, an 1814 pagoda and sweeping lawns, and you realize you don’t want to rush off from Culzean Castle. There is too much to see and do right on property. Culzean Castle: the Perfect Setting for a Hero. 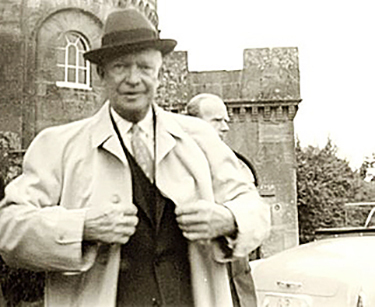 President Dwight D. Eisenhower on a visit to Culzean Castle, now home to the Eisenhower Hotel, in 1959. Most of our generation of girls grew up on fairy tales. We knew about heroes—they were the ones who always rescued the heroine. Also for our generation—those born when World War II was still a very fresh and recent memory—Dwight Eisenhower was certainly a hero, idealized by parents and grandparents, the Savior of Europe, later the President of the United States. 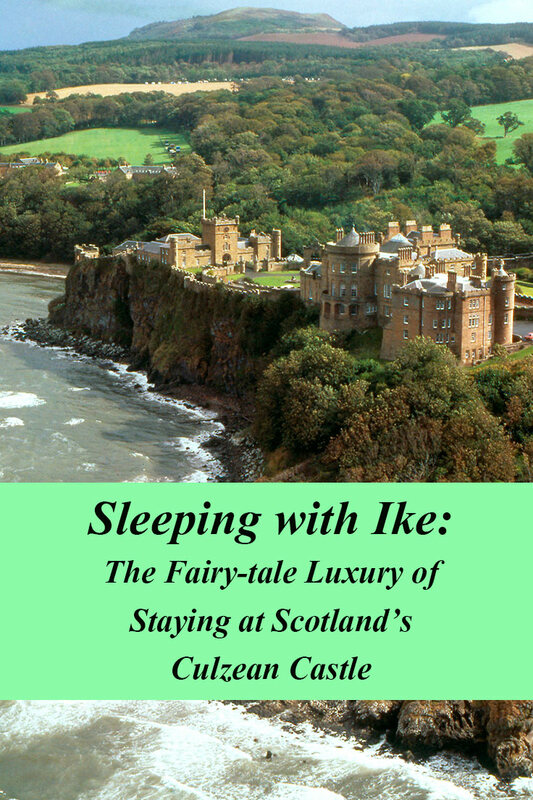 So it is only fitting that Ike found respite and comfort at Culzean Castle. With all the dragons already slain, and the terror of World War II behind him, he could relax here. 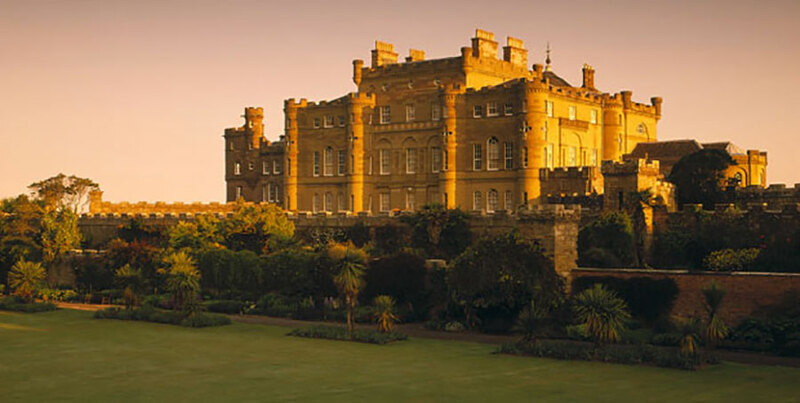 Room rates at the Eisenhower Hotel at Culzean Castle include afternoon cream tea in the drawing room and a full breakfast. Dinner is separate and is served only on Fridays and Saturdays unless by prior arrangement. A tour of the castle is included in the price. For more information, more photos and booking details, visit The Eisenhower Hotel’s website. 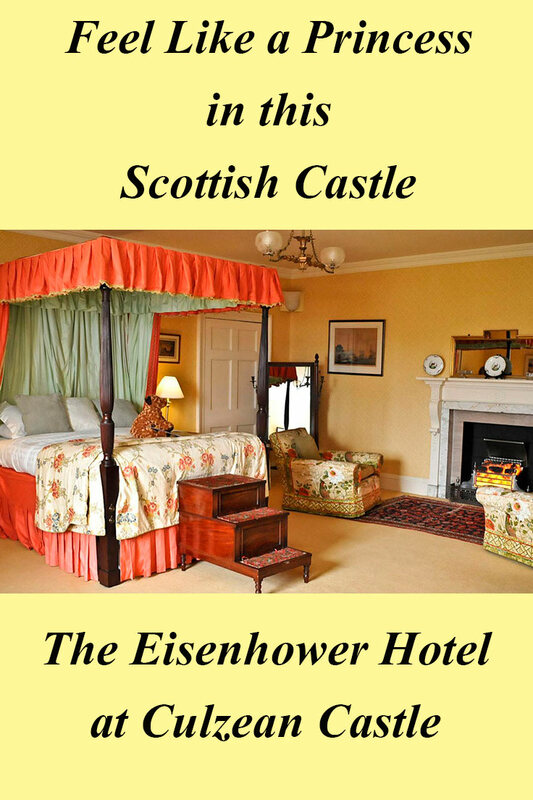 I visited the Eisenhower Hotel at Culzean Castle as a guest of the British Tourist Authority. I appreciate the opportunity. As always, all of my opinions and comments on the hotel are my personal observations. I will never recommend a hotel or event I didn’t love myself. I heartily recommend the Eisenhower Hotel for a deserved splurge. Photos courtesy of The National Trust for Scotland. Pin to Save for Later and Share with Friends…. We were at this castle on our 2007 trip and loved it. Even though we didn’t enjoy the luxury of staying in the Eisenhower Hotel. Stepping inside carries you back in time while your imagination allows you to feel life from a distant time. Rich. Yes, Culzean is very much worth a visit even if you’re not staying there. The castle, the grounds, even the cafe in the old stables. Just perfect. This article is awesome. I am a huge history buff and incorpprate it into my travels all the time. Me too, Stacey. I love having history as part as my travels. And “sleeping in history” is even better. Living history with a double cream tea. Sounds just about perfect. It was just that, Suzanne! Seeing the topic of this post just gave me goosebumps, as this was where I got married in 2004! We also stayed in the Ailsa Suite on our wedding night, and have enjoyed several visits to Culzean Castle over the years. Every visit to Culzean Castle has rewarded us with charming Scottish humour and hospitality, and your post has just brought back about 1000 memories of the great times we have enjoyed at this place. The beautiful gardens, the breathtaking views over the Aisle of Arran, the delicious meals… this location holds such a special place in my heart. Thanks for the reminder in this great post! Oh Ali, your comment made me smile all over my face! What an absolutely perfect spot to get married! I am so glad I was able to bring back happy memories for you. Culzean is like a dream. I had no idea! What an amazing ancient and modern history. This is now on my list of places to see! It is very much worth the trip, Maria, even if you just go for the day and don’t stay in the hotel. The castle is magnificent. And the grounds are amazing.